This blog is focused on providing rich content based on healthy, sustainable, and environmentally friendly living. Angaangaq and water. "life giving source of all"
Things have been ramping up and we have been very busy here at Goliath Grow! We are very excited about this last months progress and continuing to expand our reach! Check out some updates and sign up for the newsletter! While many different models of food development and distribution exist, few offer the wealth of benefits community supported agriculture (CSA) presents. In a previous article, we spoke to the benefits of buying local, organic foods to better understand your foods origin and to mitigate the environmentally disastrous cost of trans-American food transportation. Taking these ideas one step further, why not support your local farms directly or even grow your own food? In this article we will discuss what a CSA is, the benefits of participating, how to find one, and what the future looks like for CSA’s. Here at Goliath Grow we strongly believe in farming that does not rely on the heavy use of synthetic chemicals. To us, there is always a natural and effective alternative that won't compromise environmental health or your own well-being. Many people commonly spray insecticides on their crops in order to protect them from damage caused by pests; however, one of the best solutions is to use ecology and to promote a diverse population of natural predators. Natural predators will help reduce the amount of harmful pests that attack your crops and ultimately help maintain an orderly garden. There are a plethora of beneficial insect species out there and the first step towards ensuring that they survive, arrive or get purchased for your garden or farm is to be able to properly identify them. So in this blog post we have created a beneficial insect guide featuring a total of 29 critters that can be used for natural pest management. We've included their descriptions and photos as well as their favorite harmful pest to prey on. Although this is by no means a fully comprehensive guide, it should provide a good starting point for anyone interested in completely avoiding or at least significantly reducing their use of insecticides. Please note that descriptions depicted in this guide are simply guidelines for the most commonly observed characteristics of these species. We understand that what you observe in your own garden or farm may be different than what is featured in our guide as certain bugs adapt their color to their surrounding environment. With that said we are so excited to share this knowledge with you! We've provided you a total of 20 pages full of information on these incredible arthropod stewards and we hope you find them useful. So enjoy and go see what's crawling or buzzing around your land! I'm sure some of you have heard of the dollar bills with the website addresses stamped on them to track where they end up over time. In fact, many of you have probably even acquired a few of these at one point or another. While this is a very interesting experiment, do you want to play this game with your food? If you had to guess, how far, on average, do you think your food travels before making it onto your plate? The answer is an astonishing 1500 miles. The United States is roughly 2800 miles from west coast to east coast. That means your food travels almost 54% of the distance of the US before you see it. Industrial food has become more well traveled than the people consuming it and in this blog post we cover its impacts as well as reasons for why local food is the better alternative. Some environmental concerns that are commonly associated with conventional farming practices include: unsustainable energy use, mono-cultured crops and limited biodiversity, run-off from synthetic pesticides and fertilizers, excessive antibiotic, growth hormone, and additive use and most importantly, global climate change. Not all conventional foods are bad. This is not an attack on buying bananas from your local grocery store, but there are adverse effects caused by eating foods which have been covered in every herbicide, pesticide, and fungicide known to man. Studies which have deemed these to be safe for humans are rarely unbiased and there are not long term studies to correlate the use of these chemicals with an increase in the rate of disease. According to the USDA, hired farm workers make up less than 1 percent of all U.S. wage and salary workers, and only 17 percent of Americans now live in rural areas. What this could suggest is a serious gap in consumer knowledge about the underlying agricultural processes and techniques that support our livelihoods. Furthermore, Michael Pollan, author of the Omnivore's Dilemma believes that industrial agriculture has instilled the belief in consumers that all food is the same and that it is always cheap to produce. This is much further from truth, yet, whenever we as consumers enter the marketplace, we internally make this association and come to expect it as the norm. Eliminate Transportation Pollution. As we mentioned above, removing this added pollution, which in theory has no purpose, is a smart, environmentally friendly solution. Supporting Local Farmers. Local farmers work hard to grow food to support the community and their families. Many of these farmers use best practices to grow food correctly and safely. Supporting them allows them to continue their all too forgotten trade. Know What You're Eating. With local farms, you can actually visit and see what your food is, where it's coming from, and how they are growing it. You can take charge of your life and see what you are consuming with your own eyes. This is very powerful. Direct feedback to the farmer means an immediate response to personal preference and concerns, whether they be environmental or within the food source itself. Organic, Natural Food. Not all local farms produce organic food, but more and more are changing their growing techniques to incorporate good, organic practices to produce higher quality foods. It Just Tastes Better. Local foods just taste better. They are usually fuller, brighter, and come in a wide variety of selections. It doesn't look like they just came off of a conveyor belt production line. Connection. Farmers markets are a great place to visit. They offer a wide range of foods which you would sometimes be hard pressed to find in a grocery store. It is a great way to meet new people, and many times there are events or other goods sold as well. Local Economy. We mentioned supporting local farmers, but this also helps your local economy. Instead of outsourcing your money to large corporations, feeding their pockets, you can keep your money local and help build a vibrant economy. Many local communities are in dire need of this support. In his article, Home Grown: The Case for Local Food In A Global Market, Brian Halweil states, "In every country, money spent on local produce at farmers' markets and locally owned shops will stay in the community, cycling through to create jobs, raise incomes, and support farmers." A recent report from the International Panel of Experts of Sustainable Food Systems found that food also accounts for as little as 11.4% of US household expenditure, yet everyday middle and lower class Americans continue to find ways to spend an extra fifty or one-hundred dollars each month to spend on technology and leisure items. Last year’s press release from the National Retail Federal suggests that many of us could afford to spend more on food than material items if we chose to, as holiday retail sales were $626.1 billion just last year in 2015. Food isn't prioritized as it should be. Which is why industrial agriculture's model continues to live on. But what we as consumers have is the power to directly influence the current paradigm in a new direction; one that will benefit our local economy, environment, as well as our own bodies. So please go support your community today and buy produce from your local farmer! Halweil, B. 2002. Home grown: the case for local food in a global market. Worldwatch 160(1): 41-45. At Goliath Grow we believe in providing you with useful information that can help you boost the efficiency of your garden or farm operations. In this blog post, we are pleased to share an efficient and cost effective method for an entry-level compost system that you can build in a short time with little effort. Most compost storage options are extremely expensive for people on a tight budget, ranging anywhere from $100 to $500+, but one of the cheapest options is to use wood pallets. In our downloadable guide: "How to Build a Three-Bin Compost System" we've diagrammed step-by-step what you'll need to have your own robust composting station that will last for years. 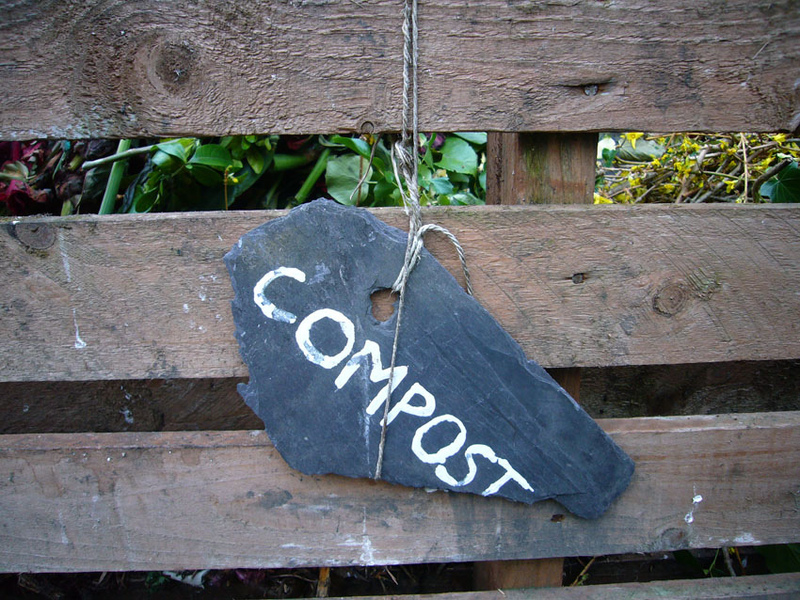 Although this guide provides a basic solution for storing your compost, we encourage you to modify the system any way you want. Some modification ideas may involve adding a catchment system to help collect any liquid nutrients that leak from the compost or even adding doors to close off each of the bin areas. The choice is entirely up to you! Feel free to share your designs with us in the comments section of this blog or on our Facebook page. Good luck and have fun setting up your own compost area! Download "How to Build a Three-Bin Compost System"
When it comes to weed control, glyphosate, the active ingredient in RoundUp, has been the unquestioned champion. Today, RoundUp has become a household name, but at what cost? With an ever growing desire from the community to focus on organic processes and less dependency on harsh chemicals, there has to be another way to accomplish the same task, right? Watch this powerful short video to see what happens when you shift from a conventional diet to a fully organic diet. Search Our Blog For Your Favorite Posts! We respect your privacy. Your email address will never leave the hands of Goliath Grow.